It’s interesting that the more companies you speak to, the less certain you become about whether organizations have truly readied themselves for GDPR. Well, spend doesn’t contain personal data … does it? Be afraid, very afraid — spend data can be packed with personal data. Personal data that is processed wholly or partly by automated means. – Personal data that is part of a filing system or intended to be. The only exclusions are things like immigration checks, police investigation, personal activity and personal data generated by an activity outside of EU Law. So, should sourcing and procurement be worried? I would say yes. Temporary labour – the name of the person, rate and other details may be included in the invoice text. There may be a lot more personal data across e-procurement and other data sources. Data inventory analysis is designed to identify those elements … assuming that someone has realized that spend data may contain personal information. However, does it matter? We would say yes. A name in this type of data identifies a person very quickly. We even know who James Smith, our consultant, works for. Vendor name of course. If you are not moving the data outside of your own environment (within the EU), the risk is reduced – but there are several elements to consider. However, if you have a spend analysis provider outside of the EU then the problems are suddenly more acute. Our guess is that many of the larger analytics providers will have scrutinized the Regulation and accommodated the required changes already. For many smaller providers that service European clients from outside of the EU, recognition of the legislation complexities may not have even started. The Regulation goes live in under a month. The question is – do European clients and analytics providers both inside and external to Europe have the right level of compliance – and understanding of the obligations? They aren’t optional either. Perhaps it’s time you asked your provider if you are an EU company. In the next article we will look at some of the complexities of spend data that sits in the GDPR domain. Part of the reason the GDPR legislation has been introduced is to fundamentally change how personal data is managed. This isn’t a “nodding dog” legislative change – of that there is little or no doubt. This entry was posted in Market Intelligence, Training on April 30, 2018 by thedoctor. First of all, it’s a cat. 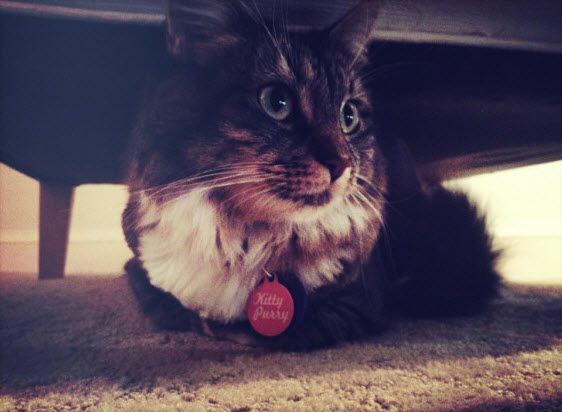 Secondly, we know that Kitty Purry likes Katy Perry music. And given that every time the doctor walked into a general session, it was Katy Perry song that was playing, it just seems like the right thing to do. After all, Kitty Purry loves to ROAR! This entry was posted in humour, Miscellaneous on April 28, 2018 by thedoctor. Sourcing only identifies value. But value is not realized until it is captured. Capturing value requires each purchase to go through the system and be realized as a perfect order — the right product at the right place at the right time for the right person at the right price using the right delivery method, and so on. In order to make this happen, an organization has to do more than source — it also has to execute, track, report, and correct. Otherwise, it will fail to realize 30% to 40% of negotiated value (which is a statistic that has been well known for almost a decade). However, the only way an organization can properly source, execute, track, report, and correct procurement operations is through proper program management, which is much more than just executing an event, negotiating a contract, and filing it away in the contract management system. It’s taking that e-paper and making an e-process out of it, preferably in an integrated Source-to-Pay platform that can insure each step of the program is followed. This requires a program-management based platform, something which the average Procurement organization does not have as most first, and even second, generation sourcing platforms did not have any real program management built in. And when one thinks about what is involved when one tries to consolidate the messy and muddled functionalities scattered across the ERP, analytics, invoice processing, contract management, supplier management, and other supply management platforms across the organization, supply program management can be a difficult and complicated task. The solution of which is an effective program management strategy, backed up by an appropriate platform-based solution. To find out how to get started, download the doctor‘s latest white paper on The Importance of Program Management For Savings and Value Realization”, sponsored by SynerTrade. The read will be worth your time. This entry was posted in Best Practices, Process Transformation, Procurement Innovation on April 27, 2018 by thedoctor. Do You Need Spend Analysis? DOES YOUR ORGANIZATION SPEND MONEY? No. You don’t need spend analysis. YES! YOU NEED SPEND ANALYSIS! And don’t say you can’t afford it. Given that Spendata offers a single user annual license to a best-in-class do-it-yourself tool for $699, you can afford it. And when you consider companies like Spendency offer enterprise do-it-yourself solutions starting at the 3K/month price point BIQ used to start at (and SpendHQ isn’t that much more per month with their entry level offering) and once you set up the mappings, you’re set to go, you can. Especially when you can use it to identify an average savings of 10% year over year. And don’t tell me that do-it-(mostly)-yourself is not an option. It always is! You just need a bit of training. And that can be obtained at an affordable price point as well. Contact Data-TrainingWorx limited about their SpendataWorx program, which can include an LMS consisting of 40 online interactive videos and over 800 two page “microbite” documents that is everything you need to know to get started and analyze your data … for years! Remember, you need it, you can afford it, so just get it, and just do it. This entry was posted in rants, Spend Analysis on April 25, 2018 by thedoctor. Of Course Catalogs Can’t Be Trusted to Manage Low Value Spend! They’re a tool in a machine. Saying you trust a catalog to manage your spend is saying you trust a hammer to pound that loose roundhead nail back into the wall stud. It can, but only in the hands of a reasonably skilled laborer who can hit the nail on the head at an appropriate angle to drive it back in (and not bend it, knock it out, put a hole in the wall or knock himself unconscious on the recoil. Similarly, a catalog is only going to serve its purpose and deliver value in the hands of an appropriately trained buyer or employee who knows how, and when, to use it. And the fact that a spend management company had to pay Spend Matters to run an article that made clear 3 reasons catalogs can’t be trusted to manage low-value spend shows that, despite all this talk about strategic sourcing, category management, digitization (or any other flavour of this overused, always misunderstood buzzword you care to imagine), and cognitive procurement, Procurement, overall, is still in a sorry state of affairs overall. Not only are we in the situation where at least a third of mid-size and larger organizations don’t have any modern solutions at all, and of those that do, a majority are still on what we’ll call legacy first-generation solutions which are cumbersome to use and low on power, but this also puts us in a situation where those un-enabled organizations don’t have the platforms to improve processes, reduce workloads, and allow the Procurement team to execute, and get comfortable with, more advanced and strategic sourcing methods. To these organizations, a catalog looks like an answer to tail-spend prayers. Get a few master contracts for common low-value, low-dollar purchases, load them all into a modern, single search, single view, federated catalog, and allow people to buy whatever they need through the catalog. And while this is a valid strategy for some purchases, and can really take a huge workload off of an overworked Procurement team’s plates, it doesn’t solve all the problems. Unless it is always-on, up-to-date (which could require a dedicated catalog manager), federated single view, capable of filtering to in-stock items only, and guided (showing the mosts popular or typically best choice when there are multiple options), an employee will spend way more time looking for the item then she might spend using it! Catalogs are not set and forget. They must be managed! Vendors don’t focus on this, especially if they don’t have a modern solution with strong vendor self-update capabilities (where a buyer only has to review vs. doing all the work), and a buying organization that chooses the wrong catalog solution can end up worse off than they were before they acquired a solution. Procurement can always get a better deal on volume or discontinued items (and when its an internal item for consumption, sometimes it just doesn’t matter; such as pens that get lost before they are used, cleaning suppliers where packaging doesn’t matter, etc.) and when an item is getting purchased frequently enough, it’s best just to do a bulk order and put it in the store room. A catalog will never alert you when the time is right to take something out and do a bulk-buy. And this is fine, as long as an organization knows that just like you can’t set and forget a catalog, you can’t forget to run the analytics on the purchases on a(t least) a quarterly basis, preferably monthly, to make sure the right purchases are going through the catalog and, at the same time, review the non-catalog P-card and T&E spend and see if other types of purchases should be put in the catalog. As the article notes, uninformed employees will sometimes bulk buy thinking they are saving money (even if the savings per unit is negligable), when in fact they are tying up capital when the item is low use and the other 10, or 100, will sit in the storeroom for months (or years). Sometimes they will scroll three pages in to find an in-catalog, non-preferred, item that they prefer (and costs twice as much, but because all inventory from office supplies vendor A is in the catalog at a flat 10% discount off of MSRP, just in case something else is needed than formally specified in the contract, they can do it). And so on. And if we’re talking electronics, and the organization doesn’t know how to secure certain non-standard devices, this could be very, very, bad from a data security and privacy standpoint. Catalogs are a tool to manage tail-spend, but only one tool, and they need to be part of a larger tail-spend strategy to deliver value. Never forget that. This entry was posted in Best Practices, Procurement Innovation, rants on April 24, 2018 by thedoctor.